The menu consists of links to the selected pages in the TYPO3 CMS backend. The menu consists of links to the subpages of the selected pages in the TYPO3 CMS backend. The same as above, but showing the abstract of these pages as well, when not empty. This will render a menu of the subpages of the selected pages. Below each subpage an extra menu will be showing the titles of content elements which belong to that certain subpage, which have the option "Show in Section Menus" in the Appearance tab enabled. 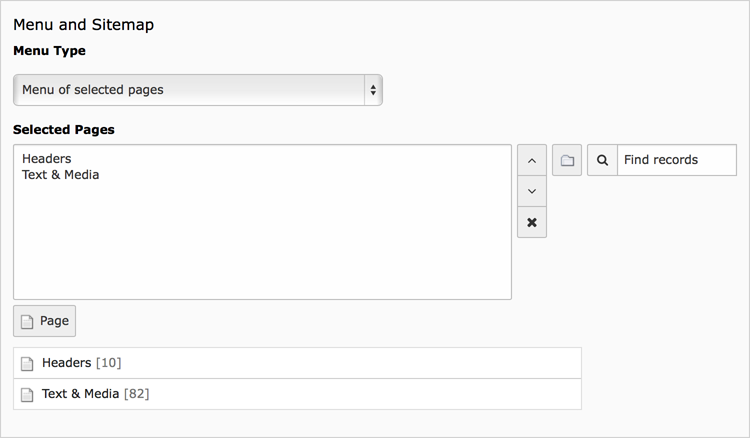 This makes it possible for the website visitor to jump to the selected content element, within that page, immediately. Render a full sitemap of the website, starting at the root page. Render one or more sitemaps at once. The starting point of each site map will be a single selected page. Menu of content elements within the selected page, which have the option "Show in Section Menus" in the Appearance tab enabled. This makes it possible for the website visitor to jump to the selected content element, within that page, immediately. Shows a list of pages which are updated in the last 7 days. Updated does only mean a change in the page properties, not the content on the page. Shows a list of the selected page and all other pages, which have one or more keywords, entered in the page properties, in common. Displays a menu of all pages which have been assigned one or more of the selected categories. Displays a menu of all content elements which have been assigned one or more of the selected categories. The availability of links in each type of menu will depend on access rights. If a website visitor has no access to a certain part (with a frontend login), the link will not be shown. In case no pages are selected (in most options), the menu will be rendered from the current page where the menu is put on.